We know you have a lot of choices when it comes to movers in Roanoke. Choosing the best can be difficult when faced with so many options. But Luke’s A+ Moving stands head and shoulders above the competition for many reasons. From our friendly personnel and skilled movers to free estimates and competitive customized packages, we offer it all. If you’re searching for a mover in Roanoke you can trust, whether for local or long-distance, look no further than Luke’s. We’re a family owned and operated business that prides itself on attention to detail. We work extensively in Roanoke, TX, a Denton County town within Dallas-Fort Worth home to just 8,000 people. Not only are our movers professional and experienced, they are friendly too. We strive to make your move as pleasant as possible. After all, you’re starting over in a new place. Let us be the friendly faces that take you there! We’ve worked hard to earn our customers’ trust, and you’ll notice the difference when you choose us. We boast state of the art moving equipment with some of the largest trucks in the Dallas Fort Worth Metroplex. Here’s a look at some of the best reasons to choose us for your residential move. Prior to your move, we’ll disassemble and quilt your furniture and leather. We will shrink-wrap upholstery and furniture with movable pieces to protect them during all phases of the move. You can even keep most items in drawers. We will lay down runners to further prevent damage to new floors, walls and banisters. 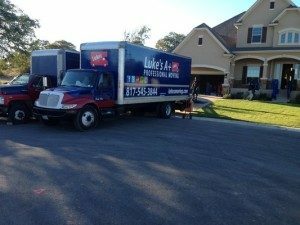 To learn more about our moving services in Roanoke or to obtain a free estimate, please contact us at 817-752-9766 or email us at info@lukesaplusmoving.com. We are based at 235 NE Loop 820 in Hurst, TX but we cater to a wide service area.